The Ultimate Decorative Clothespin Shaped Magnet Set Has Finally Arrived! Are you looking for efficient yet stylish ways to store things or tidy up your kitchen? Do you hate messy magnets that require drilling or leave irreversible scratches on fridges or metallic areas? Are you are fed up with unreliable and weak fridge magnets that keep on crawling on your fridge door? If the answer to those questions is yes, then you should keep on reading because we have something special for you. Our modern magnets have been made in such a way so as to be used for a great number of various performances. Place them on any magnetic surface like a refrigerator, a steel shelf, a bulletin board, a magnetic school whiteboard, your office desk or inside your garage and liven up the area on the spot. The sturdy and non-slip wooden grip will hold anything that you want. Your mail, file folders, recipes, maps, small bags of food, the calendar or cute love notes! It's all up to you! The bonus strong Neodymium refrigerator magnet organizer will be able to hold up to 19 pounds (8.6 kg) in direct pull and will comfortably keep all of your items standing upright nice and easy. Just stick the provided 3M tape to the bottom of the Neodymium hook and enjoy this round magnet right away. Their beautiful colors and well thought construction will make this set of 8 wooden magnet clips a wonderful addition to any house, office, college dorm or even classroom. What are you waiting for? Get yours today and one as a housewarming gift to a friend! ✔ STURDY & STRONG - Each of the wooden clothespins have 2 magnets on the back side which creates a strong pull force and the clothespins are made of fine wood which makes them Unbreakable. ✔ CUTE & EYE CATCHING - Our chip clips state of the art designs will compliment any given area or surface you place them on. Create a mini art gallery and display your kids arts in a cute way. ✔ MULTI PURPOSED - Display memos, photos, shopping lists & recipes, You can even hang small kitchen towels with the bonus hook magnet that is included in this set. Turn your kitchen, office, cubicle, whiteboard or even a locker into a small artistic show. ✔ THE PERFECT GIFT - Not another boring commercial set. 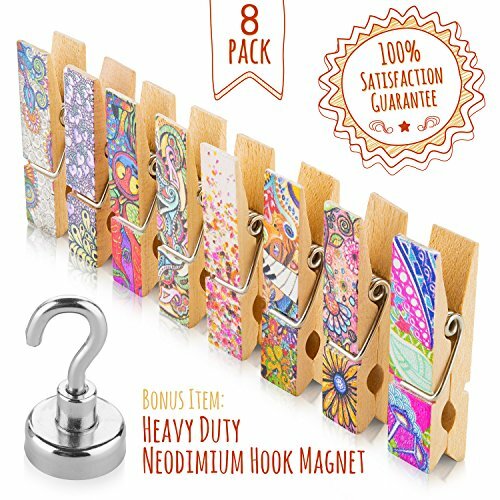 Our`s was designed by an artist, Each of the 8 clothespins has it`s own colorful unique style which make this set looks like it`s custom made just for you. ✔ LIFETIME GUARANTEE - We are so confident of the premium quality of this set that we are willing to refund you ANYTIME if you are not completely satisfied with your purchase. If you have any questions about this product by Treats&Smiles, contact us by completing and submitting the form below. If you are looking for a specif part number, please include it with your message.